Transit operators do it all! They navigate tough traffic, help passengers get where they need to go, and do it all safely and with a smile. And they're in demand—a key part of why the Seattle metro area leads the country in transit ridership growth. King County transit, Link, Streetcar, Access paratransit operators and Water Taxi crews carried more than 156 million riders in King County in 2017, and Metro Transit carries about 400,000 riders each weekday. Transit drivers don't have an easy job, they just make it look that way. We're celebrating with riders and commuters on March 18th. 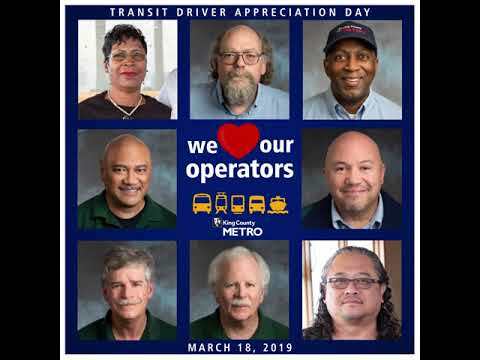 King County Executive Dow Constantine and transit riders across the county celebrate the contributions of our hard-working bus drivers, Access drivers, rail operators and Water Taxi crews. Please take a moment to thank your driver—something as simple as a smile and a wave when you board the bus or train, and a "thank you" when you leave. Download some thank you cards. We created some thank you cards you can download and print yourself. There are 4 to choose from. Please share this site with your friends, family and co-workers using these links. For social media you can use hashtags #tdad and #metrosmiles.